My little "chiquita" is the size of a bunch of bananas....see what I did there. Changes I've noticed: This dry little patch on my left cheek has been going strong for over 2 weeks now, and I finally feel like it's clearing up now that I've switched from using eczema cream, to hydro-cortisone cream. How I've been feeling: My legs are still very sore and VERY easily prone to cramping and muscle pulls. I think I'm stretching enough and drinking enough water. Obviously I'm very wrong and wrong! More stretching and more water....got it. I'm going to check with my doctor on Monday to see if she has any other suggestions. We're getting into the real hot/humid season and it's doing a number on me. I'm just trying to stay cool and take it easy. I don't remember it bothering me too much first time around. Then again, I wasn't handling a 2 year old at the time...I also was 3 years younger. How I've been sleeping: Before bed, we've been cranking through some Bob Ross videos on Netflix...and it's just so riveting that I've been a bit of a night owl. This adds to my exhaustion during the day, so I should probably lay off the painting shows! Food and exercise: YES! I've gotten a few REALLY good workouts in this week! My June challenge group is just what I needed for a boost of motivation. 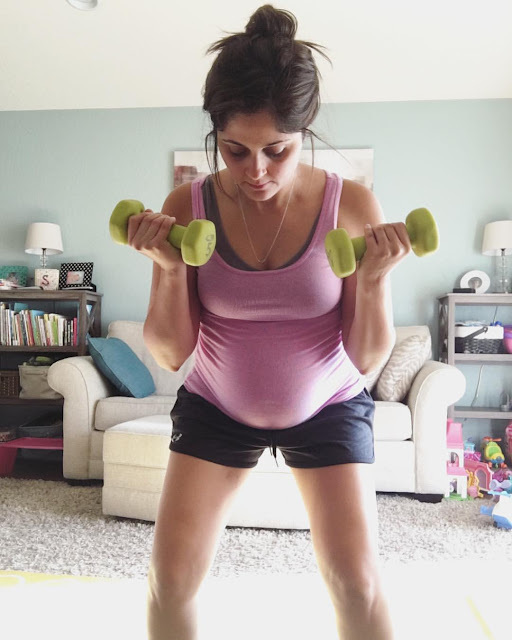 My favorite is Autumn's Active Maternity workout videos on Beachbody on Demand! I did this quite a bit in my first trimester, but haven't been consistent with it so far during the second. It feels good to get back into it (and to do something other than yoga), and I'm looking forward to starting the third trimester video next week! I've been doing well with my breakfast and lunch choices, and as far as dinner I've been better about not eating until I'm completely stuffed! I've also been laying off the sugar. I should find out ANY day how my glucose test went on Monday! Maternity clothes: Shorts, shorts and more shorts! This is definitely different from last time....obviously I'm not handling the heat well because it's so not like me to not LIVE in leggings! Best moment this past week: That post-workout high! LOVE the feeling of accomplishment when I finished my workouts from beginning to end....lots of times I only do half and say I'm going to save the rest for later (which often doesn't happen). 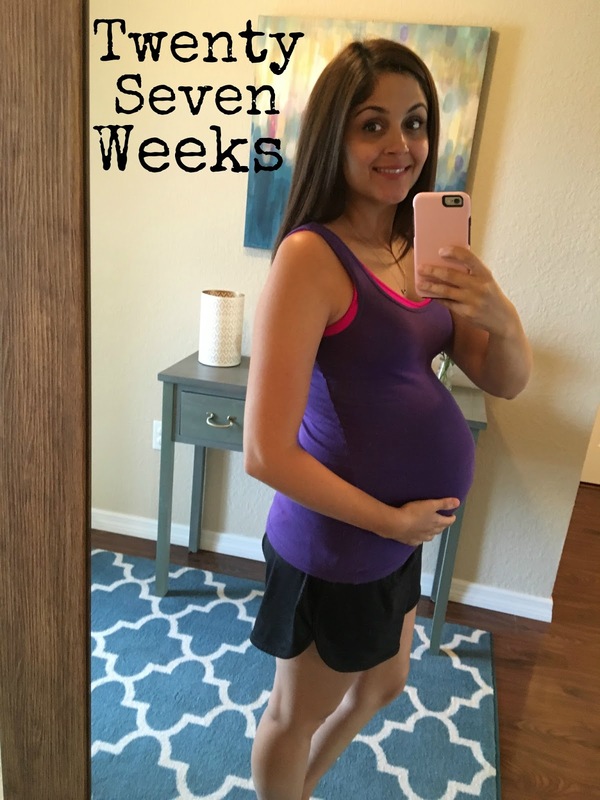 Click HERE to check out 27 Weeks with Ella Rose!